For everyone that advertises with us, Standing Room Only will act as a public relations machine for each and every business, band, musician and artist in return for the support. Each SRO sponsor will receive multiple, free announcements each week on our SRO Facebook Page. The SRO editorial department also publishes feature articles, profiles, announcements, reviews and photos on both our website and Facebook page for all our sponsors. This creates the biggest “bang for your buck” each and every month. A new sponsor’s first contract must be paid in advance before first ad appears on website. Once credit is established, a sponsor can be billed moving forward. Pre-designed ads are desired, but we can create an ad for a client if needed. Deadlines are the third Friday of each month, to be ready to go live by the first of each month. Available in four sizes placed in four regions of the website. See rate plans below. Leaderboard ads (940px x 100px) are at the very top of specific pages. 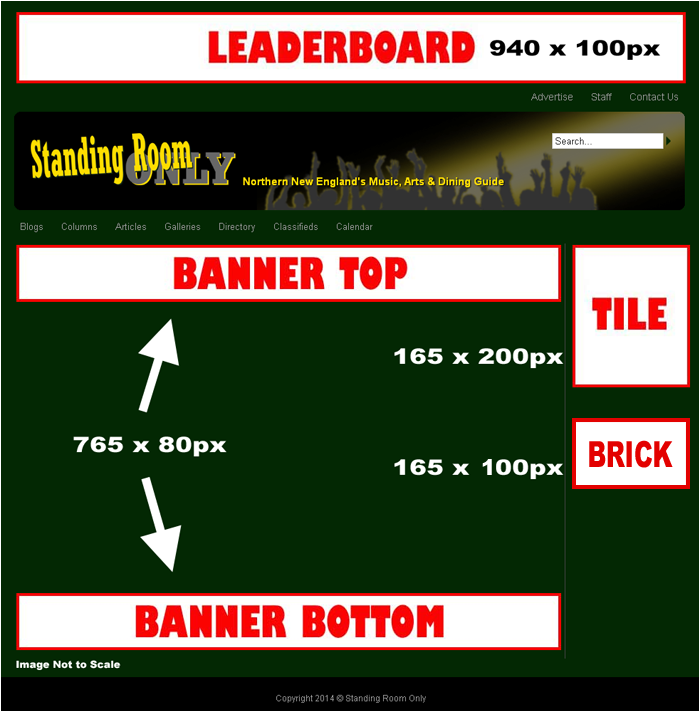 Banner ads (765px × 80px) spanning across the page body top. Banner ads (765px × 80px) spanning across the page body bottom. Tile ads (165px x 200px) are in the upper region of the page right margin. Brick ads (165px x 70px) are in the lower region of the page right margin. A full page ad that includes logo, contact information, product listings and multiple photos for your business, categorized in your business type. A one year contract is $25 per quarter. Ad changes can be made each quarter.